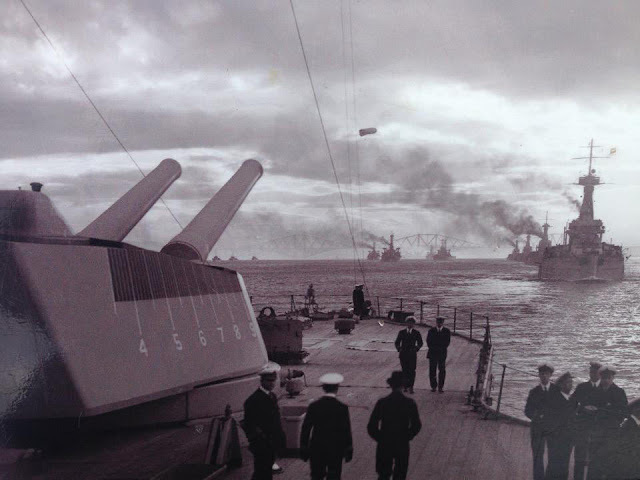 As I write this, almost exactly a century ago the Dreadnought battleships and battlecruisers of the Royal Navy's Grand Fleet and the German Navy's High Seas Fleet were in action off the Western coast of the Danish peninsula; sometimes referred to as Jutland. Over the course of one of the greatest sea battles ever fought the fate of the Entente and Central Powers hung in the balance. If Germany could break the "ring of steel", the Royal Navy's distant blockade, by isolating and destroying portions of the numerically superior Grand Fleet and ultimately wresting control of the North Sea from their enemies the war could have had a dramatically different outcome. However, thanks in no small part to the vast British naval construction programme, and reforms conducted in the years before the war, the German goal was never realised. The "ring of steel" held and the Entente prevailed. That's the short version of what happened, but the reality was far more complex. The Royal Navy's war from 1914-1918 wasn't just a handful of famous fleet engagements; the names of which are written down in history textbooks. The action at the Heligoland Bight, the battle of the Falkland Islands, the battle of the Dogger Bank, Jutland and the Zebrugge Raid. While these were moments of intense action, they were atypical. A handful of days of fierce combat, where titans clashed on the high seas. While the courage of the men who went to sea in "the fleet that Jack built" (referring to the radical First Sea Lord John "Jackie" Fisher) is unquestionable, we often forget that courage takes many forms. It was never simply a question of a few isolated sorties to confront the German fleet. The First World War at sea was as much a grinding attritional battle as the conflict on land. The drawn out determination of men in all of Britain's warships, great and small, for four long, hard, years helped ensure the defeat of the Central Powers. Today and tomorrow we commemorate 100 years since the action off Jutland, but in a little over a day's time we will go back to our lives, and many will forget. For the men of the Royal Navy in 1916 each day after Jutland was another in the long hard months of training, sorties, scouting and blockade duty in the North Sea. Each day was another spent keeping the sea open to friendly shipping and firmly closed to hostile commerce raiders. A day from now, when the hundredth anniversary of the battle Jutland passes, I shall still take another moment to remember the sailors who, after having witnessed the titanic clash of fleets, made ready to go to sea once again. While the great battlefleets on both sides often dominate the public view of the First World War at sea, the myriad of smaller ships: cruisers, destroyers and gunboats, on lonely stations, were just as crucial and crewed by men no less courageous. Jutland ensured the Royal Navy kept control of the sea, but it was how they used that control that really mattered. It is to the efforts of all who served in the Royal Navy throughout the Great War I dedicate this poem, for our world is built upon their backs. I am eternally humbled by their courage, service and sacrifice. Or where the Baltic ice is thin. They seldom tow their targets in. Show where the one-eyed Death has been. That is the custom of “The Trade."